—Brian Walker, CEO, Herman Miller, Inc.
A small business is not just a scaled-down version of a big one. In fact, some of the strategies that work well for larger companies may actually be completely irrelevant for smaller firms. 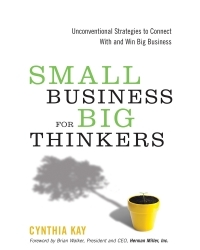 Small Business for Big Thinkers offers unconventional but proven strategies to run a better small business. It also provides a roadmap for owners looking to expand their small businesses by doing more business with Big Business. Cynthia Kay is a passionate spokesperson for small business. She spends significant time speaking to, teaching, and coaching small-business owners while running her own award-winning company. For more than 25 years, Cynthia Kay and Company has produced high-quality communications that are used on the national and international scene. It serves businesses and organizations from the Fortune Global 100 to small businesses and nonprofits. A graduate of Michigan State University, Kay also holds a master’s degree in communications. She has been honored four times as one of the 50 Most Influential Women in West Michigan. Her company has been named twice as one of West Michigan’s 101 Best and Brightest Companies and has earned a number of awards. Cynthia serves on the Board of the National Small Business Association (NSBA) and lives in Grand Rapids, Michigan.